The airplane wheels bounce onto the tarmac of San Diego’s Lindbergh Field and we jump in a rental car and head east up into the mountains. After the sparkling beaches of the California coast, the 2-hour drive is a marvel of changing geography and climate zones where pine trees surrounding open meadows give way to giant-sized boulders that cling to arid slopes. Flowering desert shrubs dot Banner Pass, the windy grade on the other side of the Santa Rosas that takes us down to the desert floor. We arrive at twilight, just as the sky turns orange and dark blue and long shadows fall across the sandy ground. It’s March when the desert is in full bloom and we’ve come to see the showy displays of flowering brittlebush, desert indigo, sunflowers and pink and lilac verbena. 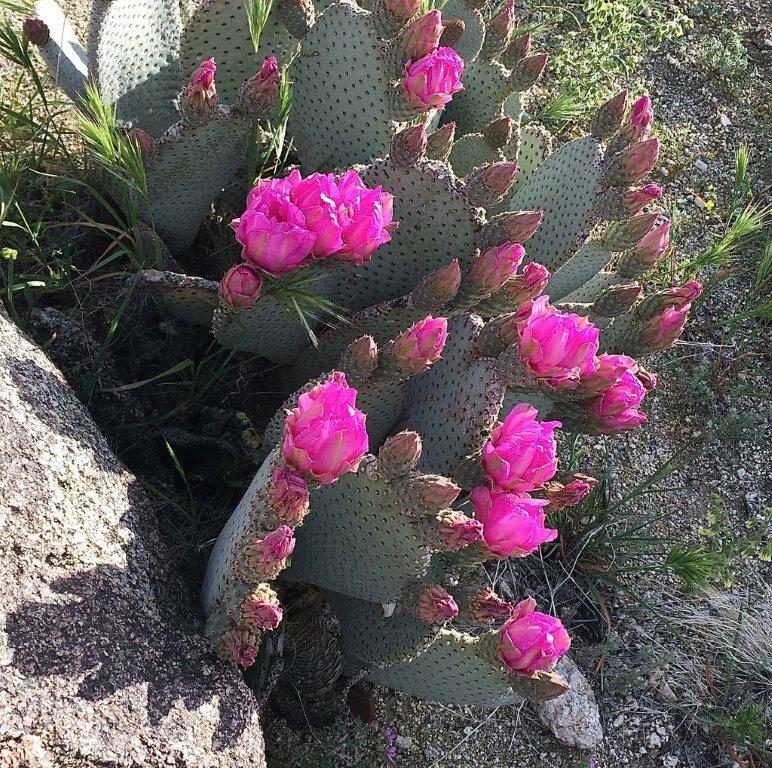 I visited the Anza Borrego Desert on a weekend trip years back when I was in college, and I see that it is still a gem. I marveled then at the holes in the mud canyon walls, the branching crevasses of the bleak badlands, and the shell fossils that littered the rugged limestone so many miles from the ocean. This trip I am determined to see a display of spring rebirth, but also to find out what created the spectacular geologic features of Anza Borrego. We spend the next three days hiking through the canyons with walking guides and talking to California Park Rangers. The history and magic of the desert is a slow reveal; we start out each cool morning and walk our way into the bright midday sunlight. The 3,500 or so permanent residents of this valley live year round in summer temperatures that can reach 120 degrees. But this time of year the climate is near perfect, dry and cool at night. The small town of Borrego Springs has grown accustomed to the visitors and “snow birds” fleeing the cold and seeking the sun; the winter population can expand to 25,000. 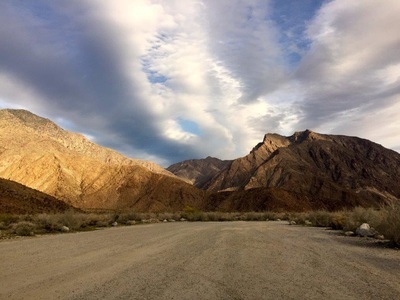 Borrego Springs is surrounded on four sides by Anza-Borrego State Park; with an expansive 600,000 acres of protected area it is the second largest state park in the “lower 48.” Deserts are full of space—especially this one. It’s big sky country too. Along with only 9 other places worldwide, including the Isle of Coll in Scotland, Borrego Springs is a “dark sky” community. The lights are muted and low and the effect is dramatic; at night the sky is alight with constellations. Fossils from an ancient seabed and brilliant star-lit night skies make this place mystical and inspiring, and artist Ricado Breceda added a little more magic. Driving across Galleta Meadows as you approach Borrego Springs, the large animal sculptures dress the landscape in surprising postures. Silhouetted in the evening sky, they can trick the eye. I could have sworn I saw one move. Where to stay: La Casa Del Zorro. If you arrive at twilight like we did, the string of small white lights on the low wooden fence outlining the entrance will welcome you. Turn in when you see the hotel’s mascot, a red fox—zorro means fox in Spanish. The fox stands between the white pillars below the sign. The white-washed buildings are on the outskirts of Borrego Springs, where the resort has been since 1937 when it was a single-room ranch house. Old adobe walls and beams of the original structure still form part of the lobby and lounge, adding to the atmosphere of rustic elegance. Today the hotel is newly remodelled with expansive rooms that feature natural stone bathrooms, open beams ceilings and balconies that open onto the courtyard swimming pools. Come to the desert in the winter when the nights cool down and sit by the fire—each room has its own stone hearth and a pile of wood to get you started.